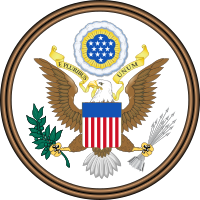 E Pluribus Unum on the great seal of the United States. "E pluribus unum" is a traditional motto of the United States. It means "out of many, one" in Latin. It has been placed on the U.S. dollar bill, and other related items. The motto was suggested by the first Great Seal committee in 1776. Consultant and artist Pierre Du Simitière chose the Latin motto, and his design expresses this theme. This motto was well known to literate Americans of the 18th century. It appeared in the Gentleman's Magazine, published monthly in London since 1731. The legend "E pluribus unum" was used on the title pages of the annual volumes that contained a collection of the year's twelve editions of the magazine. In Thomson's 1782 sketch, for the final design, Charles Thomson put this motto on a scroll held in the bald eagle's beak. "E pluribus unum" is a clear reference to the Thirteen Colonies united into one nation – symbolized by the shield on the eagle's breast. As explained in the official description of the Great Seal, the thirteen vertical stripes "represent the several states all joined in one solid compact entire, supporting a Chief, which unites the whole & represents Congress. The Motto alludes to this union." This page was last changed on 22 December 2018, at 23:34.